If you're a fan of Phoenix history, you know that Phoenix didn't start at where downtown is today, it started about where Van Buren and 32nd Street is. It was called the Phoenix Settlement, also Mill City, and even Pumpkinville. It all started in the 1860s, after the Civil War, when a group led by Jack Swilling dug a canal, inspired by the abandoned canals that they had seen in the Salt River Valley. That canal was called Swilling's Ditch, and later the Salt River Valley Canal. The canal started about where the Mill Avenue bridge is on the north side of the Salt River, and angled up northwest past where the Celebrity Theater is nowadays. Eventually it was extended west to where the Phoenix Townsite was established in 1870 (where downtown Phoenix is now). The reason for the name "Mill City" is the importance of preparing grain for bread for the soldiers at Fort McDowell. The wheat was grown in the riverbed, harvested, and milled, and sold to the U.S. Government. Jack Swilling was a good businessman! The name Phoenix, by the way, was just a fanciful name that Jack's friend Darrell Duppa liked, as it conjured up images of ancient myths. Darrell also named Tempe, by the way, which is the valley next to Mount Olympus (you know, where the Greek Gods lived). By the way, the mill in Mill City wasn't the one in Tempe, that was their competition. The mill in Mill City was Helling's Mill, where the El Molino (Spanish for The Mill) Golf Course was, north of Van Buren, west of 32nd Street. 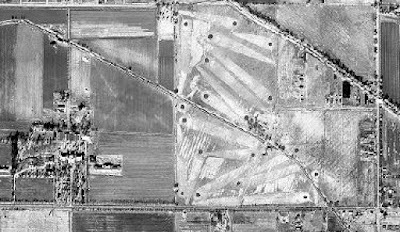 Aerial view of the El Molino Golf Course in the 1930s, Van Buren west of 32nd Street. It's gone, but the State Hospital there on the left is still there, on 24th Street. This is where Helling's Mill was, in Mill City. The official Phoenix Townsite was selected by William Hancock and settlers who probably wanted to distance themselves (literally and figuratively) from Jack Swilling. If you look on the left at the map for the cross-hatched area that says Phoenix Townsite, you can see Washington in the center and Van Buren as the city limits to the north. It went from 7th Avenue to 7th Street, by the way. Whether this was a wise place to plat the town is a matter of opinion. As you can see by the map at the top of this post, there was a dense grove of mesquite covering part of the townsite, and if you've ever seen mesquite growing wild in riparian areas, you know that it's difficult to get rid of. 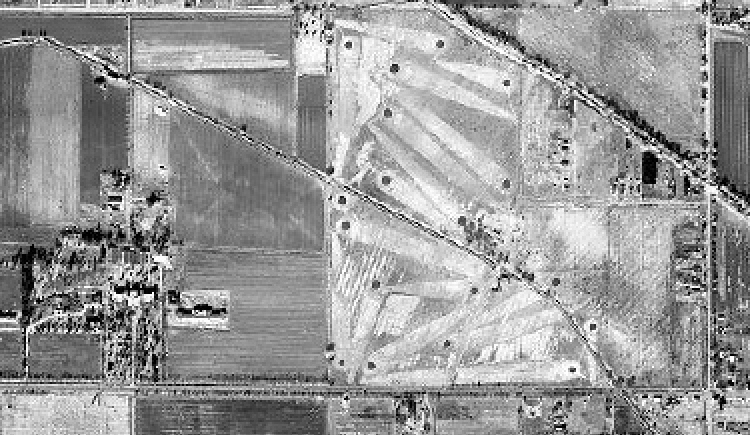 Or maybe it was the fact that mesquite was growing there that was encouraging - indicating groundwater.